I recently received this ad-mail. How do I know it is ad mail? Well it appeared in my mailbox, it has no address on it, it is obviously screen printed, and others received the exact same notice. 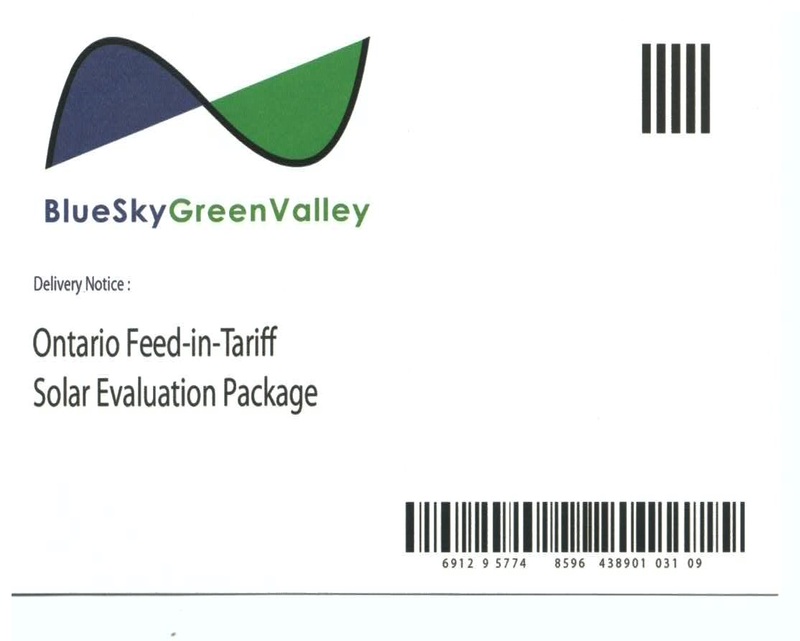 The company – BlueSky GreenValley http://www.blueskygreenvalley.com/ and they are trying to get you to purchase a MicroFIT system, for those not in Ontario Canada, it is a feed in program that you can get paid for installing solar on your home. This company is clearly attempting to use social engineering techniques to get people to call them and hear about their product. When you call they ask for personal information which I am sure they database. We are teaching people to avoid real scams, and here is what appears to be a legitimate company, using what in my opinion is a deceptive marketing practice, and methods normally employed by criminal organizations to market their product? The questions that come to mind when I received it range from things like… If you are willing to trick me in this way to get me as a customer, how will I be treated when I am a customer? 52. (1) No person shall, for the purpose of promoting, directly or indirectly, the supply or use of a product or … any business interest, by any means whatever, knowingly or recklessly make a representation to the public that is false or misleading in a material respect. In my opinion they knowingly made a misleading representation with this advertisement mailer. 74.01 (1) A person … who, for the purpose of promoting, … the supply or use of a product or … any business interest, by any means whatever, (a) makes a representation to the public that is false or misleading in a material respect. The key phrase is “Material Respect” — In my mind suggesting I have a package that I do not — which is the entire intent of this face notice — IS MATERIAL. 381. Every one who makes use of the mails for the purpose of transmitting or delivering letters or circulars concerning schemes devised or intended to deceive or defraud the public, or for the purpose of obtaining money under false pretences, is … liable to imprisonment for a term not exceeding two years. I think that is all I have to say on the matter. I scanned the barcode on the front and back, and guess what? Hi I just received the same card. It was made to look like a missed delivery from a courier or Canada Post. I am so offended by this kind of blatant dishonesty that I would refuse to deal with them on principle even if they were giving these systems away. Who is their competitor? I’ll give them a call. This comment was removed by the original poster. The original note included proprietary inside information about the company. 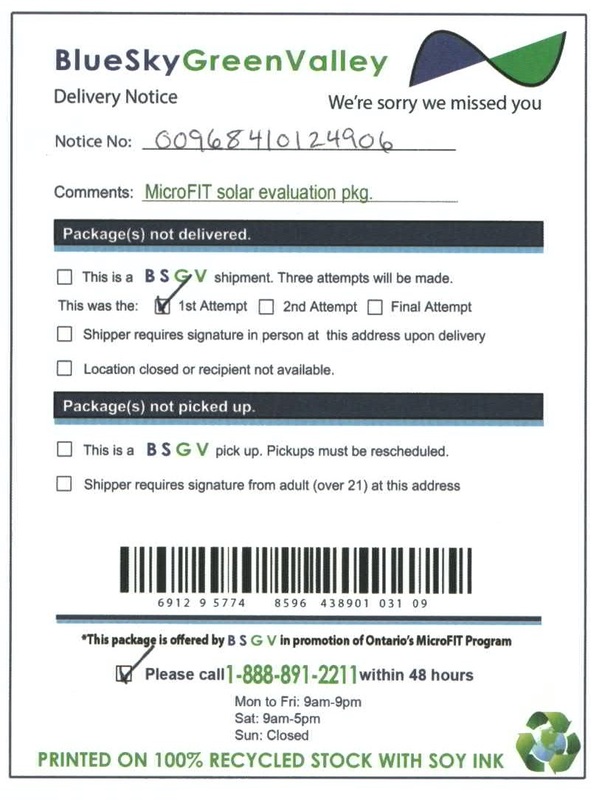 This wouldn’t constitute fraud if the rep who left the notice had a “MicroFit Solar evaluation package on hand that was to be offered/delivered to you. Also, there is neither any value indicated nor is there any request for any kind of payment, be it monetary or otherwise. It does seem misleading IF certain assumptions are automatically made upon viewing the notice. Additionally, there is no actual sense of urgency indicated, just a (direct) request that you call the number within 48 hours. If it stated that the package would be returned to sender or that you would no longer qualify to receive the package (or some other potential “penalty”) if you failed to call the number AND that being penalized would result in a personal material loss to you, then it could be interpreted as fraudulent. Basically, when applying your definition of fraud, I fail to actually recognize what is misleading unless certain assumptions are made by you. I guarantee that there would be no legal justification to warrant calling this fraudulent. It would be like trying to sue Kellogg’s for fraud when, after taking the time to separate the raisins and bran flakes in a box of Raisin Bran, you found you couldn’t fill 2 scoops with the raisins. Unfortunately, at no time does Kellogg’s state what constitutes a “scoop” or how big the “scoops” are that are used to measure the raisins. Just got a second one in two weeks from Solar Vantage. One would be sceptical just looking at a preprinted form card. Canada Post must be hard up for sales $$$ to be involved in delivering misleading advertising. The owner of BlueSky GreenValley is Ian Nicholson, thanks to the comment from Den^ looks like they are using the same marketing tactics as the previous company. Ian Nicholson was high up with Verve Energy (YouTube search it), Verve energy drink business model is now banned in Canada & USA. He’s full of fluff and it takes him multiple sentences to get a basic point across, he tries to perused with weak metaphors and unrealistic “dream” oriented thinking. This same card was dropped into my rural mailbox in Prince Edward County. Apparently this was their second attempt to deliver a package to me. I wasn’t expecting any package and soon realized it was a scam. It made me angry so I phoned them and yelled at them. But I am sure many people were fooled and sucked in. My elderly mother would have been if I had not warned her. Worse than the Indian computer scammers. They have no shame in their greed.